convention sketch by Danny Cruz! - drew this awesome sketch of the Yeti! Okay, he did other stuff, too. I'm just generalizing. But check out the sketch! It's pretty cool and I love it. That's reason enough to post it here. So I did! Check out Danny's deviantART page! 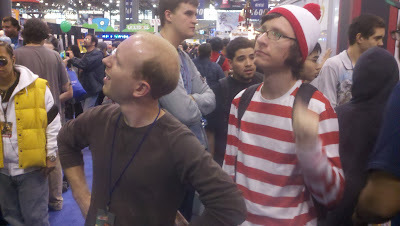 Here are some more scintillating pictures from the New York Comic Con. The show is now...what, three weeks old? But it's still relevant, I say! Just go with it. Obviously, there were a lot of great costumes at the show. This guy did a nice job with the right hand of doom. Oh, wait! They both have gloves on of some sort! I just got that!! Not all of the awesome things people wore were costumes. I gotta get me one of these Frankenberry shirts. It took forever to find this guy! 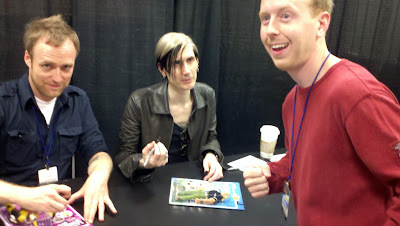 I waited in line for a couple hours to see both Jackson Public (left) and Doc Hammer (center), creators of the Venture Bros., but it was worth it! Each of us is looking at something different in this picture, which I think is fitting. "Who do you think I'm supposed to be? ", this guy asked as I stood next to him to get this picture. "Reed Richards", I answered, and it seemed pretty obviously at the time. He was skinny and a bit bendy, and the hair, I thought, matched. He was a little put off by my answer. "No, I'm Johnny", he said. Sure, buddy. Sure. A shot from the floor. After the show on Saturday, we stopped at the famous Gray's Papaya hot dog shop and had...a hot dog. We figured that they must be expecting the recession to go on for quite a while to buy a neon sign advertising their special. And check out the cab in the front! Perfect framing. Labels: Fantastic Four, Frankenberry, Hellboy, Marvel, New York Comic Con, Thundercats, Venture Bros.
Day one of Xcon World is behind us, and while we wait for what is sure to be a fun Saturday at the show, here's a gem from the New York Comic Con. While chatting with the folks at the Fubar booth, Jeff McComsey, Dominic Vivona and I were subjected to an impromptu interview regarding the book and, more specifically, WWII General George Patton. In the video I'm embedding below, you can find us around the 8:10 mark. It's something to see, for sure. Keep in mind that throughout this video there's some fairly harsh language. If you're not the type for bad words...well, I might consider skipping this round. I'm so glad the camera caught me putting the helmet on. And yes, fervent viewers - my answers were obviously quite awesome. The wheels of progress keep turning, and there's no rest for the weary. 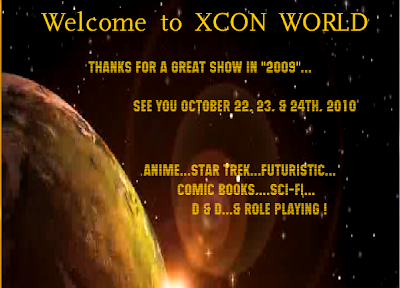 If I had a bit more time, I could probably come up with more generic platitudes dealing with the fact that Wagon Wheel Comics will be exhibiting at this weekend's Xcon World in Myrtle Beach, SC. If you weren't able to make it to the New York Comic Con or just prefer an atmosphere that's a little more calm (and, you know, if you're in the area), you can come to the Springmaid Beach Resort in touristy Myrtle Beach and check out Teddy and the Yeti! The show is open on Friday from 2-6, Saturday from 10-7 and Sunday from 10-3. Yes, that means that I'll have to listen to part of Sunday's Steeler game on the radio...but I'll survive, I hope. Or perhaps continuously run out to the lobby to check on what's happening. In any case, I'll have my normal slew of books for sale (minus FUBAR, which completely sold out at NYCC), plus my smiling face. And isn't that what really matters? Okay, we'll have rice krispy cookies as well. It's time to look at some pictures from last week's New York Comic Con! There was lots of fun to be had, plenty of costumes, and a good number of visitors to the Wagon Wheel booth - if you're one of them and are new to the blog, thanks for stopping by! Now let's put a few images up on display! So there I am, minding my own business at the booth, and who do I run in to but the Yeti! Well, "a" yeti, anyway. This fellow was promoting a new Animal Planet show (of all things), but he was generous enough to stop to take this picture. I went for a crazed look in this picture, and I'm glad it turned out well. Outside of the Javits Center on a sold-out Saturday morning. There were so many Venture Bros. characters running around the convention (it helped that there was a VB panel and signing with creators Jackson Public and Doc Hammer). These two were great - I hope that henchmen end up replacing Stormtroopers eventually (but I'm not holding my breath). Part of the booth setup: a new wire comic rack that doubled as a crochet Yeti holder. 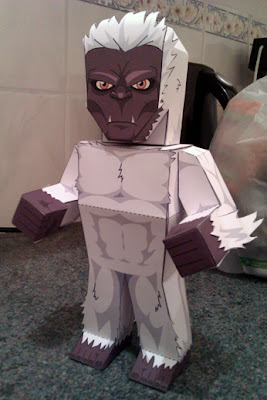 The Yeti dolls were a big hit! I had to take a picture to prove that someone was willing to pay money for Franks and Beans. I repeat: SOMEONE WAS WILLING TO PAY MONEY FOR FRANKS AND BEANS! This cannot be understated. Also, we both decided to wear Jane Cobb hats from Firefly. This guy obviously knows his stuff. I spent some time at the FUBAR booth with Jeff McComsey and friends, and was around to be interviewed by the guy in the Captain America hat. I'll post a video of the interview soon - it's something to see, for sure. After the show on Saturday night, Dave Ryan of "War of the Independents" fame threw a party at a nearby Irish pub. Great times! Gordon Gano and the Ryans played and I met some cool people. ...aaaand afterwards Larry, dressed up as Lion-O, got some pictures taken at Times Square. Let's stop there for now! I'll post more pictures soon. New York, New York! (Comic Con) What a wonderful town! And...Comic Con. That silence you've been hearing permeate this blog (permeate, I tell you! It's a metaphor!) 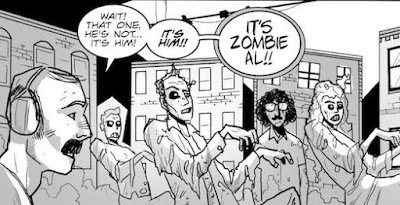 over the past week has been the auditory representation of my exhaustion from the recent New York Comic Con. If that last sentence didn't make much sense, it's because I'm still pretty beat up from the three terrific days I spent at a booth at the show...and what a show it was. I met a lot of great people, sold a whole bunch of books and other items, and ended up with some cool swag. It was an eventful time and something I'm really glad I did. Saturday was by far the busiest day of the weekend - people were literally shoulder-to-shoulder throughout most of the convention (and by "literally", I mean they actually were, as opposed to when people actually mean "figuratively"). It was a bit frustrating to move around on this day, but there was a lot of traffic around the Wagon Wheel Comics booth if for no other reason than there was a lot of traffic everywhere. I'm happy to say that Teddy and the Yeti (and Fubar, and Franks and Beans...) got a lot of exposure and got into a lot of hands. I also managed to hand out a good number of copies to professionals like Todd Nauck, Peter David, David Lloyd, Mark Waid, Joe Quesada, and other people in the industry. Danny Cruz did a lot of sketches at the Wagon Wheel Booth and made the show even more enjoyable. He did a few Teddy and the Yeti pieces (and drew a great addition to my Thing sketchbook) that I'll try to post scans of here in the future. Larry dressed up as Lion-O from the Thundercats and had his picture taken a few thousand times. People snatched up the crochet Yeti dolls as I knew they would. I met the creators of the Venture Bros! It was a great weekend. It was a crazy weekend, but it was great. Really, it was, from almost every angle. This post is quickly spiraling out of control into an experiment in stream of consciousness writing, so I'll wrap it up with the intention of writing more soon. I'll post pictures from the show starting tomorrow, so look for that as it arrives. My thanks go out to everyone who stopped by the Wagon Wheel booth to flip through a book, pick up a card, or just chat. What a fun time. The New York Comic Con - the show that I've been staying up late to get ready for every day this week - begins tomorrow, and it promises to be a really fun time. If I make it out alive with all my wits, I think I'll call it a win...not that I don't have higher hopes about getting Teddy and the Yeti in front of a broader audience if I can. Duane Redhead, superstar artist on Teddy and the Yeti, will unfortunately not be able to make it to this show (booooo!) - it's on another continent for him, so go easy on the fella. But take heart! Today I managed to get in touch with the supremely talented Danny Cruz (his Conan-esque art is above), and I'm happy to say that Danny will be on hand at the Wagon Wheel Comics booth this weekend. 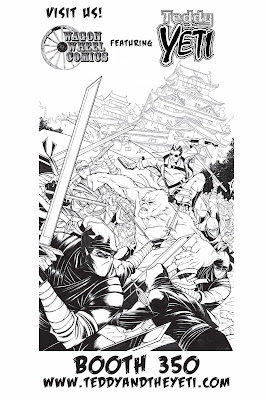 Danny has a broad, epic feel to his work, and I look forward to getting to sit down and chatting with him over the next few days - and I'll be sure to twist his arm a little and try to get him to contribute to my Thing sketch book (which is approaching legendary status). If anyone reading this blog is making his or her way to the show this weekend, stop by the booth and say hello! 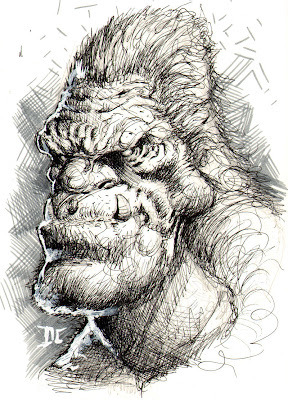 Pick up a copy of Teddy and the Yeti and get a quick sketch from Danny. There will be snacks. Oh, there will be snacks. 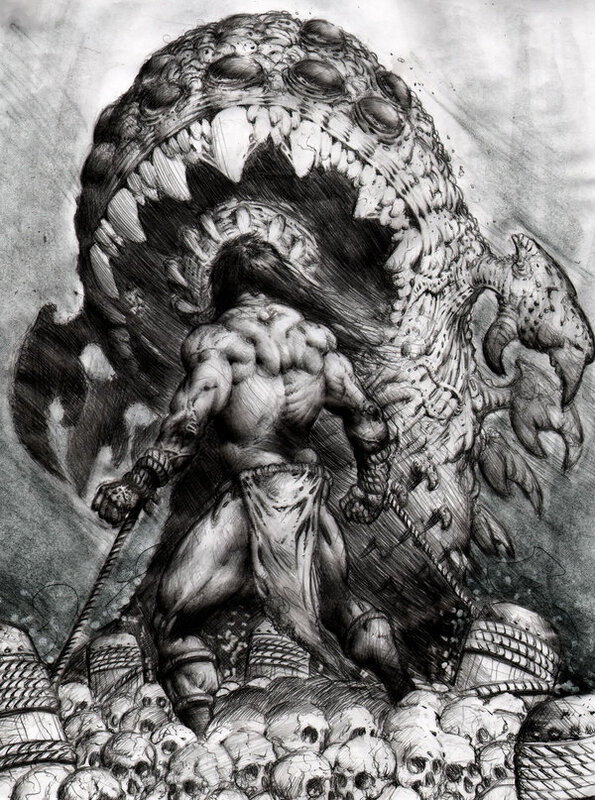 Check out more of Danny's artwork at his deviantART page! Xavier Gale-Sides of the great site "My Paper Heroes" got in touch with me today with the exciting picture you see above - he's made custom Teddy and the Yeti paper heroes! Each figure is printed out on paper and needs to be cut out, folded, and taped together to create the three dimensional object that looks oh so cool. Ted stands about six inches high, with the Yeti a bit taller. 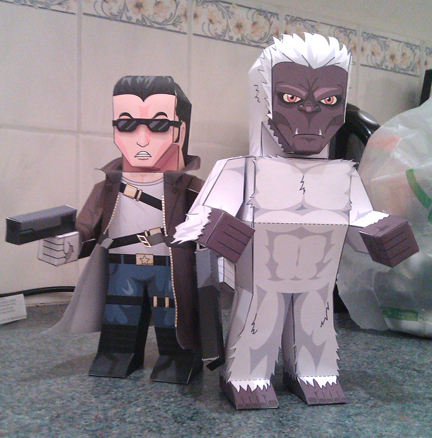 I'm making my own (of course) and bringing them to the New York Comic Con (happening sooooon). Once Xavier has them up on his site to download, I'll post a link on this site and EVERYONE CAN MAKE THEIR OWN! Seriously, that would be awesome. Anyway, I'll have patterns printed out at the convention table for anyone who wants to grab one (maybe they'll be like a dollar or something). It's like a model and an action figure rolled into one. And it's 100% the best thing I've seen in my inbox all day. I whipped this flyer up today - if you're standing in line to get into the New York Comic Con at some point this upcoming weekend, chances are I or someone I know will be handing you one of these. Why? It's advertising! And I hope it's allowed, because if not, then I'm going to be printing out lots of stuff that will be floating down the Hudson River. Okay, not really. I don't litter. I actually love the environment. BUT YOU KNOW WHAT I MEAN. 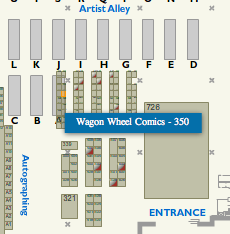 - The Wagon Wheel Comics booth has been renumbered: it's now located at booth 350, as opposed to 550, which I was originally told. I don't think there's been a change in where the booth will be physically; for some reason they just decided to renumber much of the small press section. 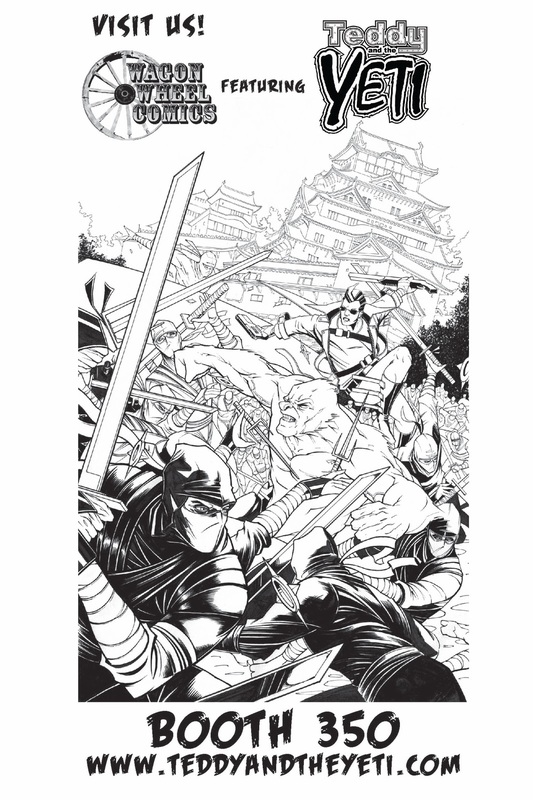 We'll still be there, though, right next to Artist Alley, near similar booths with Khary Randolph, David Lloyd and other creators whose work greatly overshadows my own. - I forgot to mention this last time, but the Teddy and the Yeti trading cards that turned out so well were printed by Versicolor. Yes, I realize that versicolor is a type of skin fungus. But it's also a printing company! Check out their website here: http://www.versicolorproductions.com/! - What you see above is not some strange alien marking, but Teddy and the Yeti's own individual QR code (Wikipedia explains its function pretty well here), able to be read by, among other devices, any smart phone. Scanning this barcode takes you right to the main Teddy and the Yeti webpage. Look for this on everything I do from now until forever. - The main focus of the booth this year will be, of course, Teddy and the Yeti. But my friend Larry and I have been working on getting Franks and Beans some space on the table as well. To that end, we've put DVDs together of the first two season - 48 episodes! - and will have 'em at the show. 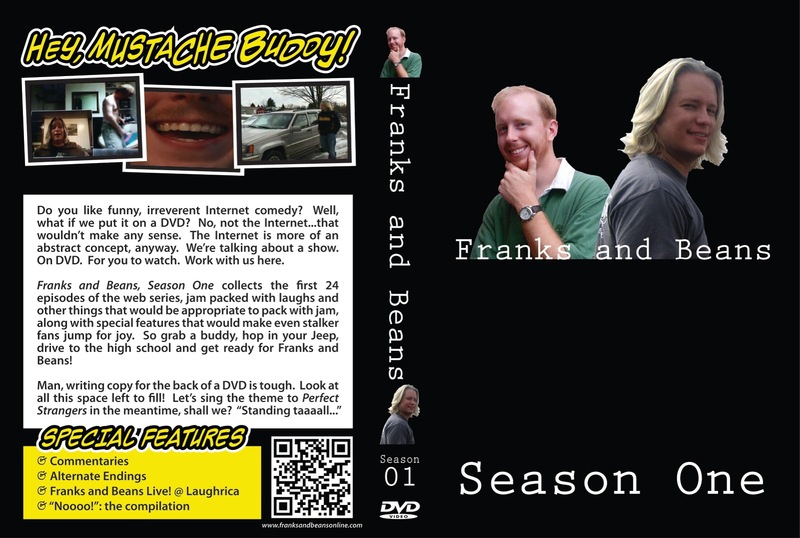 Above is the cover, front and back, to the first DVD. 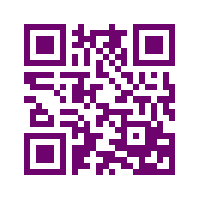 Ooo, there's a QR code on that as well!